Call me corny but Valentine’s Day is one of my favorite holidays. I love being able to celebrate the special people in my life and there’s something about adding hearts to everything that just makes it so much more fun! For this Valentine’s Day I want to make my sweetie pie something special to show how much I appreciate him. 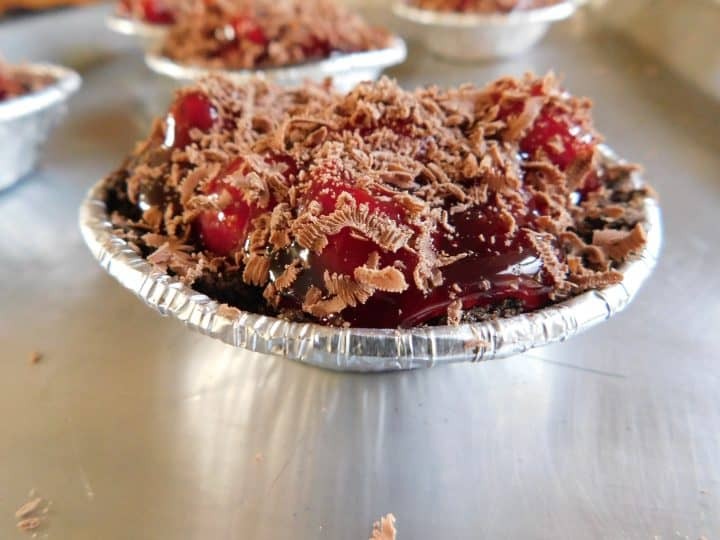 I thought what better way than with some ooey gooey mini chocolate cherry pies?! These pies can easily be made vegan as well by switching out the butter for coconut oil. I LOVE this recipe because even after a long day of work I can still whip these up in about 20 minutes! 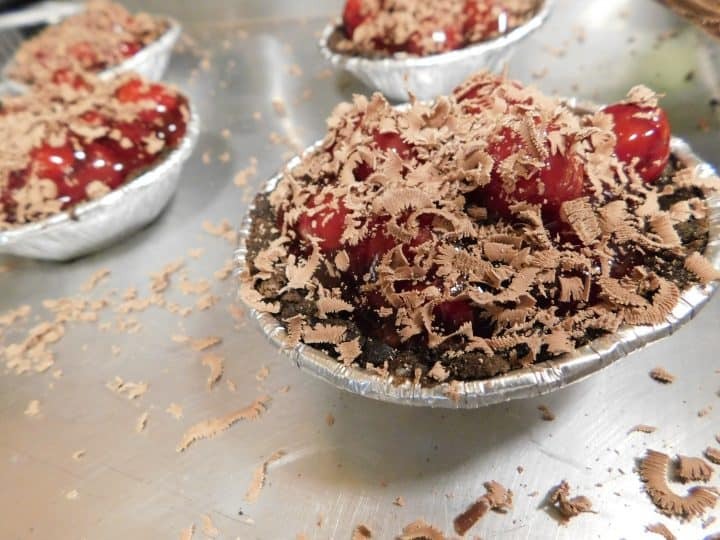 My husband loves cherries and who doesn’t love chocolate so I figured combining them would make the most scrumptious Valentine’s day dessert perfect for two. These little pies are so easy to whip up they would also be great for kids to make. My five year old nephew had a blast helping me crush the gram crackers, mix in the oil and pack it into the baby pie tins. But the best part about these little pies is the gooey chocolate on top! Once the pies have been filled, add as much chocolate shavings as your little heart desires. The more, the messier. This chocolate helps to encase the cherry filling when melted, as well as provide that extra yummy, over the top chocolate that you oh-so-crave! Top with whipped cream and even more chocolate shavings to make this truly irresistible. Grab your mini pie pans and get in the kitchen! 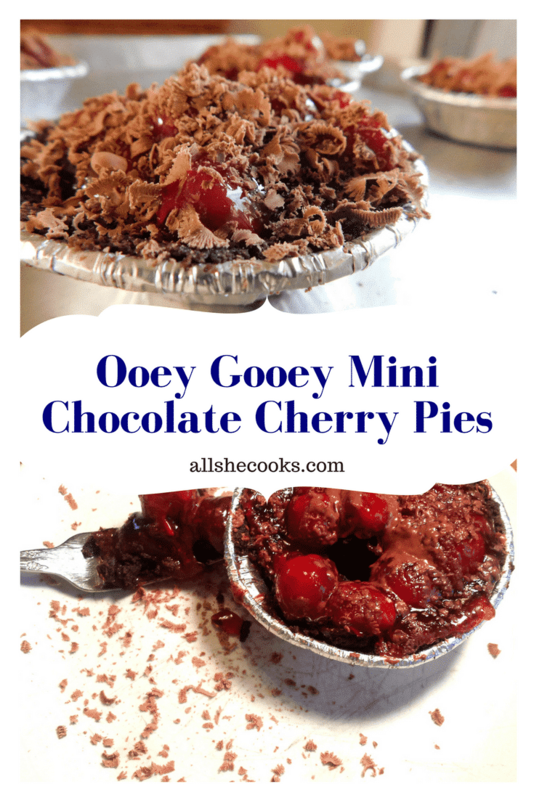 Ooey Gooey Mini Chocolate Cherry Pies is a great Valentine's Day treat or dessert for that special chocolate treat. Crush gram crackers with hands or food processor. Pack gram cracker mix into mini pie tins, about 3 tablespoons each depending on tin size. 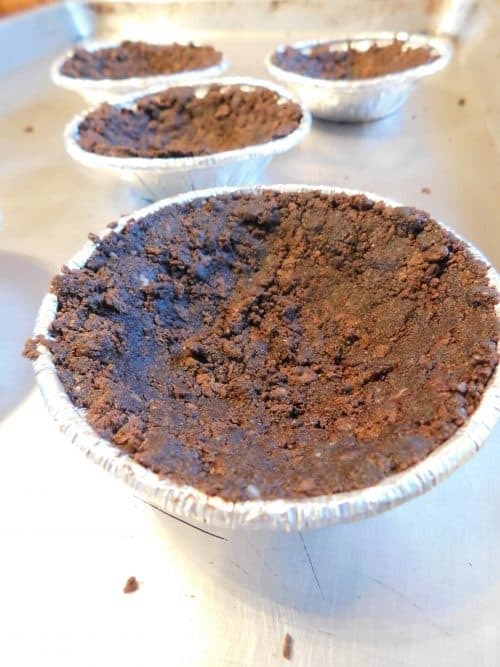 Add about 1 tablespoon of mini chocolate chips to each pie tin and about 3 tablespoons cherry filling. Cover in chocolate shavings. Add pies to oven and bake for about 15 minutes or until chocolate is melted. Top with whipped cream and more shavings. I’d love to make myself these! Grr, why did I have to go low carb for the first of the year 🙄. I will be saving the recipe for the coworkers, aaaand maybe a treat for myself hah. They sound delicious, I love chocolate and cherries!